In 1978, Dr. John Gates was diagnosed at age 5 with acute lymphoblastic leukemia (ALL), the most common type of childhood cancer. He began receiving therapy for the cancer that affects the blood and bone marrow at a time when cancer treatments just began proving successful for some children. Undergoing years of chemotherapy, radiation, and experimental bone-marrow transplants, Dr. Gates experienced firsthand the challenges of past treatment, including two relapses, painful spinal tap procedures without sedation and weekly blood draws before portacaths existed. During long periods when he was too immunocompromised to attend school, he missed social activities while completing his coursework in isolation at home on the East Coast. Fortunately, Dr. Gates became cancer-free as a teenager. He continued to work hard to get good grades and prepare for what his family assumed he would naturally become: a doctor who treats cancer. “But even when I received my medical degree, I still questioned who I was and what I wanted,” said Dr. Gates. Soon everything made more sense to him. During his fellowship in pediatric hematology/oncology at Texas Children’s Cancer Center-Baylor College of Medicine, he became fascinated with the Center’s childhood cancer survivorship program. Given decades of improved supportive care and powerful yet toxic cancer treatments, the increase in childhood cancer survivors has inspired such programs to help them prepare for a brighter future. 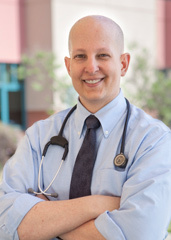 In 2005, Dr. Gates enthusiastically accepted the position as a pediatric hematologist/oncologist at Valley Children’s – located in the same area where his parents grew up and he has many relatives. By 2010, under Dr. Gates’ direction, Valley Children’s launched a formalized Childhood Cancer Survivorship Program. The only one of its kind in the region and among a small handful statewide, the program’s participants receive personalized treatment therapy summaries, and a tailored risk-assessment, screening and follow-up plan. Our Childhood Cancer Survivorship Program has grown from seeing 130 survivors in 2010 to more than 350 in 2014, totaling more than 1,200 visits since it began. 50 years ago, childhood cancer was virtually incurable. More than 80% of children diagnosed with cancer today live at least 5 years after their diagnosis. About 60% of children who survive cancer suffer devastating late effects such as secondary cancers, muscular difficulties and infertility.